While in the waiting room at the doctor's office I picked up this classic childrens' book - Egon The Cycling Mosquito - Cykelmyggen Egon. Written in 1967, it is still a popular book. 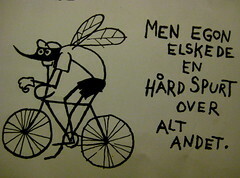 "When all the baby mosquitos hatched, they flew out of the water, but Egon rode his bike." Egon loves to ride his bike, everywhere. 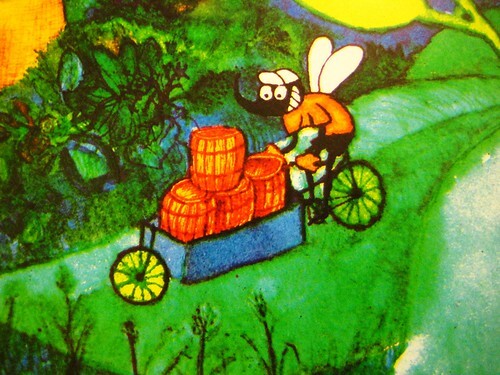 And above he helps the bees transport honey on... what else... a Danish Long John cargo bike. But it is worth remembering that Egon loved racing, too. The text above reads, "But Egon loved a hard sprint more than anything else..."
As does Matti Breschel - who won a bronze medal in the World Championships yesterday, which has thrilled the pants of the nation. There are so many books and songs for kids featuring bikes in Danish literature and music. The mere thought of starting to catalogue them for inclusion on the blog makes my ears bleed.